Hong Kong prides themselves as “Asia’s World City”, and this busy commercial city is probably the busiest playground in Asia, with many mouth-watering snacks to check out too; we are just about to share with you the 10 Must-Eat Local Foods in Hong Kong. Well-loved for countless reasons, and visited by many from all over the world, Hong Kong is a heaven in many forms. Among which, of course, is it gourmet offerings that unites foodies from all over the world. There is no such thing as ‘dieting’ when in Hong Kong. When we think of ‘diet’ when in Hong Kong, we really meant ‘diet for the soul’ – which means stuff your faces in all the amazing local foods. Please, do yourself the favour and check out these 10 Must-Eat Local Foods in Hong Kong. Your life will be complete, and they will have you counting down to your next trip to Hong Kong. 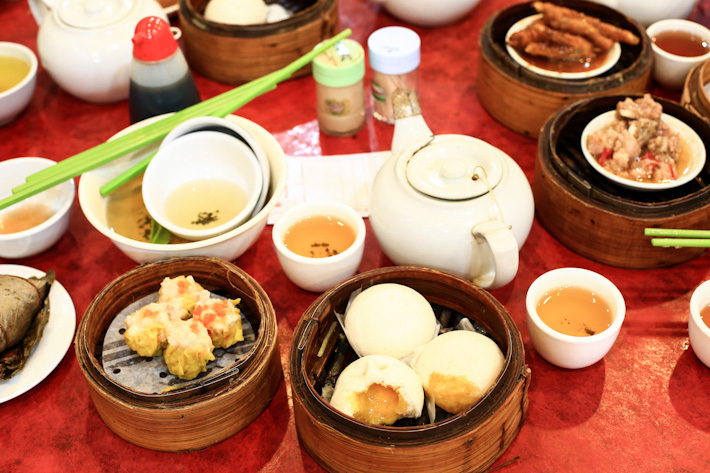 Hong Kong is also unofficially but very affectionately known as the ‘Land of Dim Sum’. Essentially delicate-size snacks that are served in baskets, eating dim sum is like a ritual in Hong Kong, and is part of a local’s lifestyle. We never say no to a good dim sum meal, and it is something we look forward to waking up to when in Hong Kong. There is no lack of dim sum options in Hong Kong, and you can read our post here on the Dim Sum Restaurants in Hong Kong. But if there is only one you must go to, it has to be One Dim Sum. It is a nondescript and humble outlet at Prince Edward, and on to the menu, an assortment of dim sum awaits you – nothing is above HK$26. Egg tarts in Hong Kong are of a different league – the top, if we must. 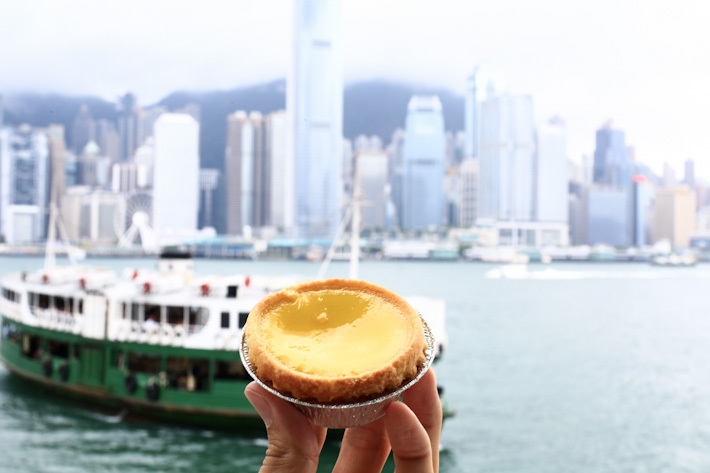 The best egg tarts are found in Hong Kong, and what you an expect from a good Hong Kong-style egg tart is a baked buttery pastry shell that flakes as you eat, with rich creamy egg custard that is wobbly and mildly sweet. We have this love-hate relationship with egg tarts; very much more of ‘love’, definitely. Why ‘hate’, you may wonder. Because for some unbeknownst reason, egg tarts are extremely high in calories. Well, we try to forget about this fact whenever we are in Hong Kong, because egg tarts are too damn good to pass on. And where do you find the best egg tarts in Hong Kong? Head straight to Honolulu Cafe. For just HK$8 per piece, this is satisfaction at its very peak; happiness can be so affordable. Egg waffles are also known as ‘Gai Daan Jai’ or ‘Gai Daan Tsui’ in Cantonese, which literally means little eggs when translated. 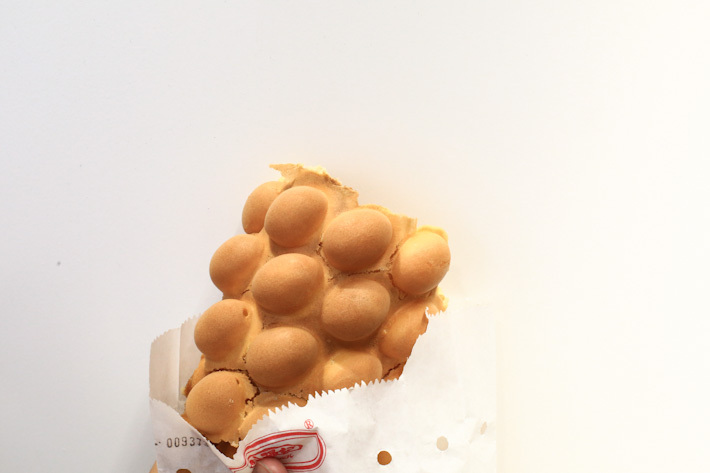 The snack is actually made up of numerous egg-shape waffle pieces that are conjoined together to form a honeycomb structure. Gai Daan Jai is an extremely popular street snack amongst the locals and they can be found on almost every street and corner in Hong Kong. The egg waffle is crispy on the outside, warm and chewy on the inside and it is interesting to note that the they are actually hollow! For the best, get your serving at Lee Keung Kee North Point Egg Waffles. Though ubiquitous, Milk Tea is a must-try when in Hong Kong. Unequivocally an iconic drink of Hong Kong, the Hong Kong-style Milk Tea is prized for its smoothness and full-bodied creamy taste. The traditional ones are prepared with black tea and milk, and usually carries a hint of bitterness within it sweetness body. 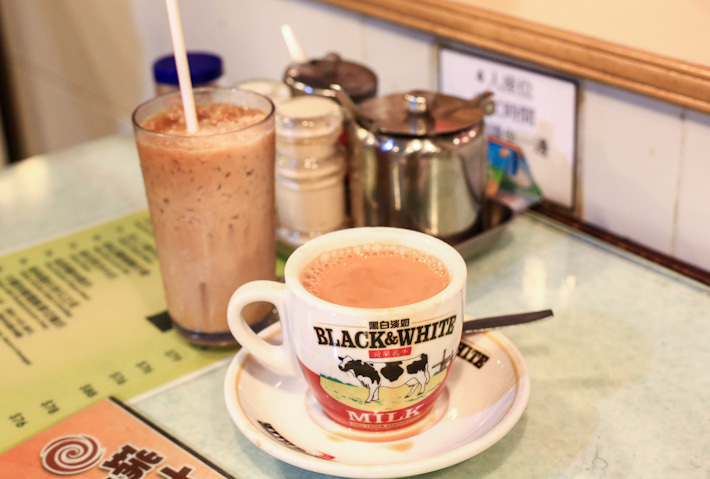 Hong Kong-style Milk Tea can be easily found in cha chaan teng, and are available in both hot and iced versions. Though the disparity between a good and better Milk Tea is not huge, and the chances of getting a bad cup is pretty low, we highly recommend Lan Fong Yuen’s version. 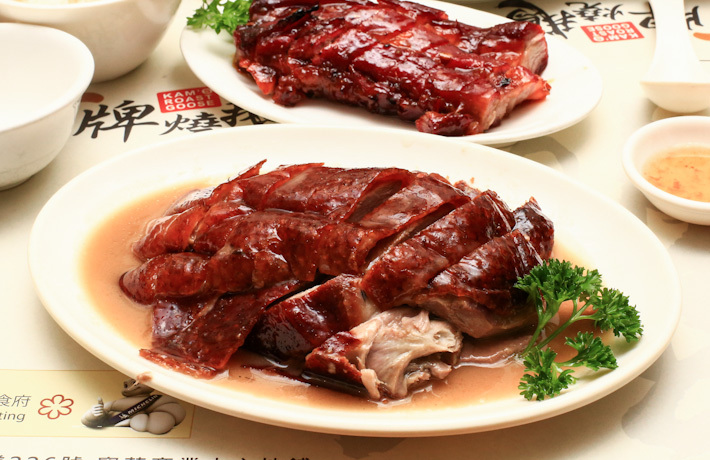 Whoever said money cannot buy happiness obviously hasn’t been to Hong Kong for their famous Roast Goose! That plumpness, that severe juiciness, those fatty layers, and very crisp skin; a divine Roast Goose is worth jogging those additional laps for. Hong Kong is home to many splendid roasts restaurants, and the highest form of indulgence is a roast goose leg (that usually comes with a premium price) served with sweet plum sauce. Honestly, the fattier, juicier and oilier, the better. And we crown Kam’s Roast Goose the Number One in Hong Kong. Or more commonly known as Bo Luo Bao. And there is no pineapple. It is a sweet and fluffy bun, with a crusty top that resembles a pineapple (hence its name) – akin to the crunchy texture of sugar cookies. A popular choice for breakfast, eat this with a slab of butter and your life will never be the same again. There are probably dozens, if not hundreds, of good bakeries, cha chaan teng and dim sum restaurants in Hong Kong that do a good Bo Lo Bao. And our loyalty is sold to Kam Fung Restaurant in Wan Chai – be there early and hit the fresh batch from the oven in the mornings. Read our guide to the best pineapple buns in Hong Kong. The irony is in Hong Kong, their fishballs are almost completely free of fish. Never mind that, because we still love our Curry Fishballs all the same. 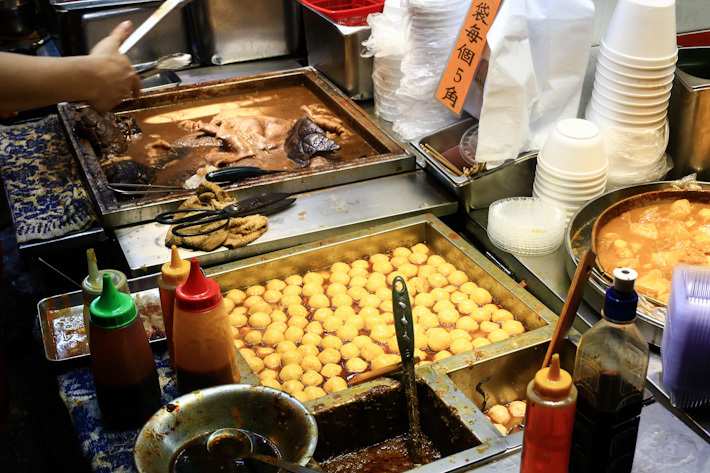 It is a classic street snack with decades of history, but let’s just skip the long stories and head straight to the point – Hong Kong’s Curry Fishballs are so spring and yummy! More often than not, they are prepared with a thick curry sauce that is sweet and mildly spicy. A cup of Curry Fishballs is tasty and ideal for sharing. You can find them at every corner and every turn, and let’s just say that whatever stall we buy them from, they are always satisfying and enjoyable. This is a very quintessential Hong Kong-style breakfast that is usually eaten in local cha chaan teng. And the macaronis in Hong Kong is one that is unique to the city, for we can never find anything close anywhere else. Do not think of their macaronis as you would of a typical Italian pasta; the ones in Hong Kong are slimmer and has a smooth surface, quite often cooked to a softness that is almost melty to taste. A typical Macaroni Soup is served with ham and egg, though it is not uncommon to find variations with luncheon meat, pork chop or sausages. 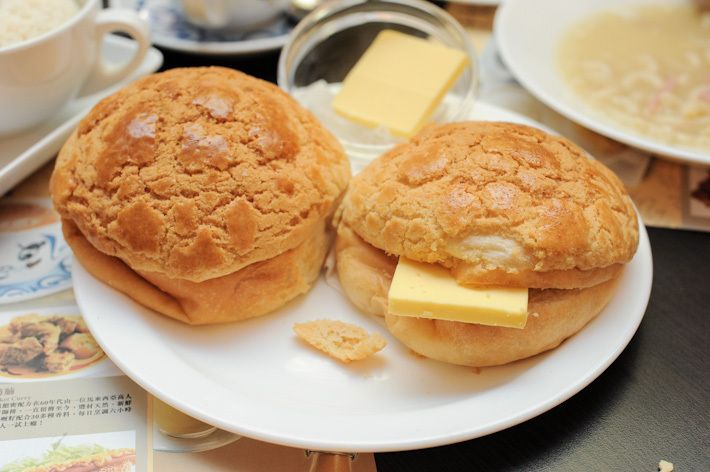 They make inexpensive breakfast choices, and are usually sold as a set with a side of buttered bun and milk tea. While there is nothing overly fancy about this dish, Macaroni Soup with Ham & Egg is still a must-try if it is your first time to Hong Kong. We have a few favourites, but Tsui Wah’s rendition never fails us. There are many variations of wanton noodles in Asia, and while they are all arguably ‘the best’ in their own rights, Hong Kong’s version deserves our love for it is ever comforting. The main ingredients are egg noodles that are cooked al dente and boast a springy texture, blanched Chinese vegetables (usually kai lan or cabbage) and dumplings (wanton) – fat dumplings that are really plump prawns wrapped in smooth skin. Served either dry or in soup, the former is our preferred version. Tossed in a special sauce and topped off with prawn roe, and presented with a bowl of wanton soup. The soup version is simpler – just unpretentiously a noodle soup dish that warms thy soul. Wanton Noodles are everywhere in Hong Kong, and Mak’s Noodle is a unanimous favourite all these years. Quite simply ‘sweet soup’ in English, Tong Sui refers to a group of Cantonese desserts such as red bean soup, gingko barley soup, gui ling gao, walnut paste and jellied beancurd. Tong Sui stalls are aplenty in Hong Kong, and many of them devote themselves to preparing fresh traditional desserts daily in-house. It is hard to choose pick just one favourite Tong Sui, so we will leave this open for your exploration. But we are pretty certain that even if you do not have a sweet tooth, you will find it hard to resist a bowl of Tong Sui when in Hong Kong. 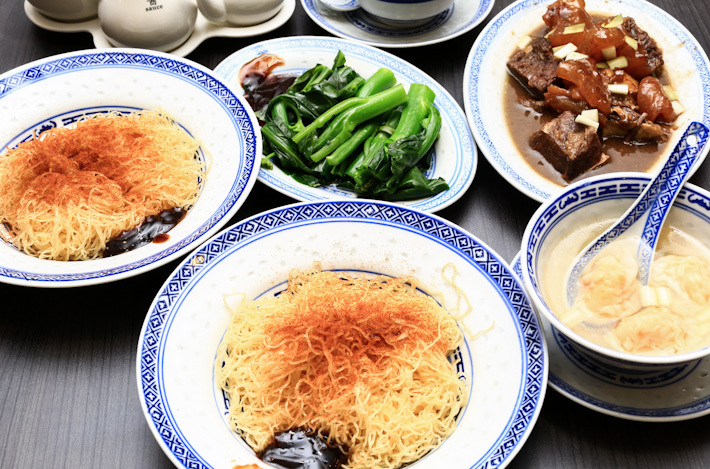 Drop by Chiu Chow Hop Shing, a 50-year-old institution in Kowloon City that dishes out some of the best traditional sweet soups from Chiu Chow province. For more recommendations, read our food and travel guides to Hong Kong. Hong Kong – a great place to experience and eat chinese food. Everything is tasty, specific and creative. 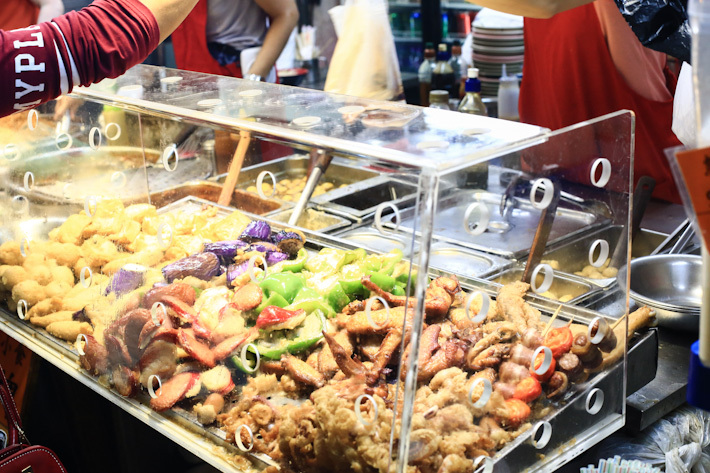 There are exceptions but I find Chinese food in most parts of America unappealing but this list of food in Hong Kong makes me want to hop a flight and eat EVERYTHING on this list and more! Holy crap, my mouth is watering just looking at it. Great descriptions btw.